Welcome to the MCCT, a National Millennium trail of diverse and unparalleled beauty. The MCCT is a non-motorized & multi-use trail bisecting California, roughly following the Mokelumne River from the river’s headwaters at the Sierra Crest down to the river’s mouth near Martinez on the Carquinez Strait. The trail is split up into five segments spread over six state counties. Just under 50% of the MCCT is complete, with more trail added each year. The MCCT is also one of twenty-seven official California State Parks trail corridors that form a statewide trail system linking mountain, valley and coastal communities to recreational, cultural and natural resources throughout the state. The MCCT passes through many ecosystems representing both natural and developed Northern California ecosystems – the bay shoreline, East Bay foothills, Delta sloughs and wetlands, San Joaquin valley farmland, river valleys & canyons, Sierra foothills, forests of the Sierra Nevada, & the high country of the Sierra Nevada. 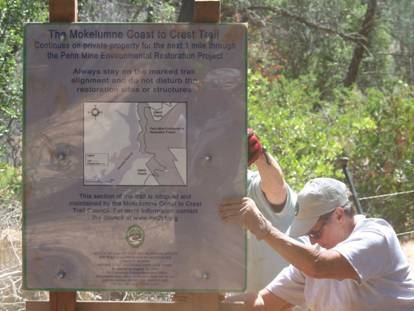 A non-profit corporation called the Mokelumne Coast to Crest Trail Council stewards the public input process, design, and maintenance of trail, in partnership with public and private organizations in the six-county cross-section of California between San Francisco and the Sierra Nevada. Please click below to learn more about us.